Over the last few years we have seen a dramatic increase in the number and quality of professional philanthropy advisory firms in the United States. This is now being mirrored globally. Several factors have contributed to this increasing awareness of what philanthropy advisers can offer and demand for these services. First, for most donors, greater rigour in their grantmaking and more effective means to achieve it are crucial in times of resource scarcity. Philanthropy advisers are seen as valuable sources of advice in this area. Second, we are seeing a significant flow of good ideas and innovations that are being shared across borders and areas of interest. 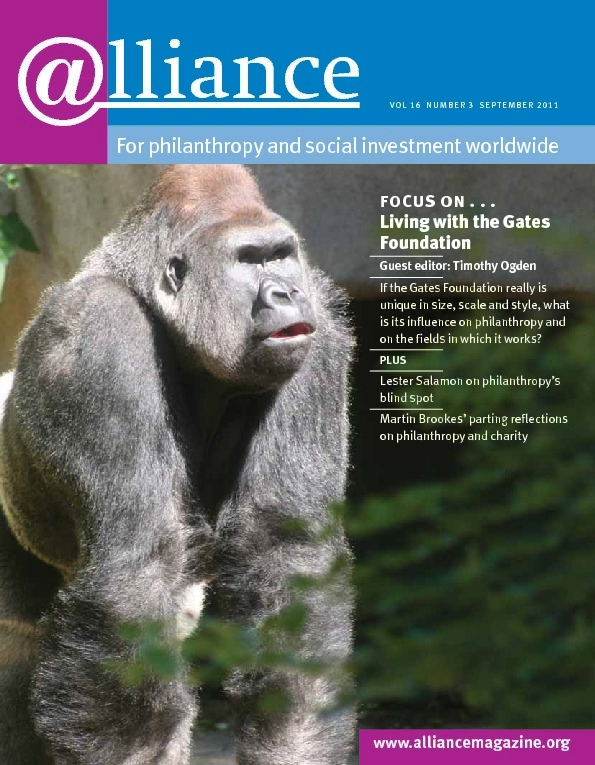 Again, philanthropy advisers are seen as a good way of keeping in touch with new ideas. Under these circumstances, advisers play a critical role in introducing their clients to appropriate frameworks to evaluate the impact of charitable organizations’ efforts. The recent acquisition by Arabella of Blueprint Research and Design has added breadth and depth to its evaluation services. Both qualitative and quantitative evaluation is needed and foundations now have the tools and professionals available to them. Evaluation, when seen as a tool for improvement rather than as a punitive exercise, can play a significant role in supporting greater rigour in giving and investing. It can help to increase results, performance and impact. But collecting and interpreting data on a foundation’s activities often requires the objectivity only a third party can bring. Professional philanthropy advisers are ideally placed to provide this service and are now in high demand as donors see the results and as success breeds success. Additionally, we’ve seen demand by both philanthropists and foundation trustees come directly through the professional cohort of advisers that already work closely with family foundations, such as trusts and estates attorneys, tax accountants and wealth managers, and with the professionally staffed, traditionally larger grantmaking entities. Professional advisers are now better positioned to delve deeper into the values and philanthropic expectations of their clients. Whether they are trusts and estates attorneys seeking the right structure for a family’s philanthropy, or wealth advisers seeking greater clarity in the uses their clients want to make of their money, they are much more confident that referring their clients to philanthropy advisers will benefit them and deepen their relationship with the client. Additionally, philanthropy advisers now play a distinctive and more prominent role in planning the exit strategy of a family-owned business. The philanthropy adviser is often in a better position to join the collective conversation and to build relationships of trust and candour with the advisers who are handling the business transaction. Philanthropy advising is now as professional as the other important services provided to families and there is a wider choice of firms to work with. These are all positive advances for the field. Moreover, new service offerings and new tools and ideas are flowing freely between and among various regions around the world. A few notable examples we’ve seen recently include the launch of social impact bonds (a financial instrument in which investors provide capital to non-profit organizations to implement programmes that achieve improved social outcomes, which in turn reduces government expenditure, the return on investment depending on the success of the programmes) in the States following the successful first test of the Peterborough model in the UK; Bill and Melinda Gates and Warren Buffett encouraging the wealthy of China and India to sign up to the Giving Pledge; and more instances of donor collaboration. Philanthropy advisers are instrumental in spreading these ideas around the world. The philanthropy advising field is still in its early days, but the sharing of ideas and networks is a necessary step to properly institutionalize it. Philanthropy advising must be at the table with other key advisers when discussing the flow and dissemination of capital. At Arabella, we look forward to both greater parity of influence with traditional advisers and to the sharing of best practices with our colleagues in the field around the globe. Why bother with a theory of change?